Ever wanted to watch a movie in ASCII art? What’s that? You haven’t even thought about it before? In what might be the single most useless feature to ever grace a video player, VLC allows you to output any video playback as… ASCII art. Yes, the kind of ASCII art that was quite fancy on BBS’s in 1988. Other than the humor and prank value, or perhaps to create your own variation of the Star Wars ASCII art thing, I don’t see much point to this, but it is very entertaining and pretty funny. So, let’s cover how you can watch movies rendered entirely in ASCII art with VLC player. BTW this tip is cross platform for all VLC players, whether it’s Mac OS X, Windows, Linux, and whatever else you feel like using this on. 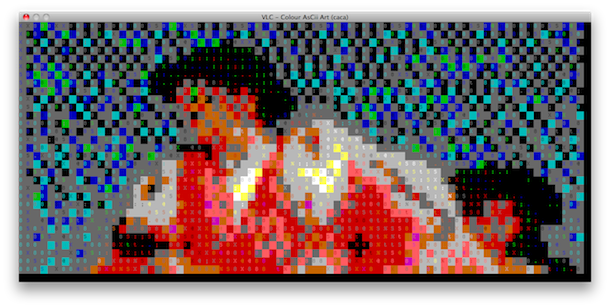 The screenshot above shows the visually stunning movie The Fall in visually ridiculous ASCII mode. Wow. Is this amazing or what? Obviously this is going to be how you watch movies from now on, right? Ok so it’s goofy, but there’s nothing wrong with that right? Have fun! Hi there. Any idea how to export video after I have converted it? I just gave this a go and VLC crashes right after opening the file…not sure what to do now! Worked perfectly for me! Very cool novelty. « How do I type the Cent Symbol on a Mac?